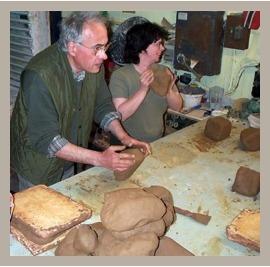 Processing the Clay | Harray Potter Ltd.
Once the clay has been dug and transported to Fursbreck Pottery, it is left out-of-doors to weather down for several months. A couple of weeks or so prior to potting the clay is sorted: broken down by hand into small pieces, during which all the large rock inclusions (>1-2cm) are removed. 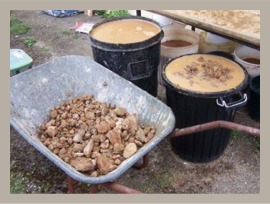 The clay is then placed in bins of water for soaking. 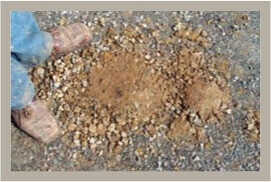 The removed rock inclusions are discarded, quickly forming compact surfaces at the place of disposal – this discarded material may have implications for the discovery of deposits of such material during archaeological excavations, that is, the residue of potting activities. 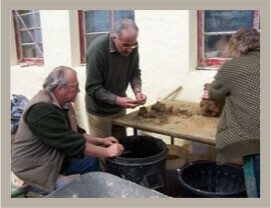 After several days soaking and around twenty-four hours before potting is to begin, the soaking clay is removed from the bins and placed on plasterboards to dry to a plastic state. 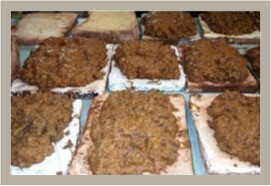 Once the clay becomes malleable it is ‘knocked up’, a process similar to kneading bread dough. This is to remove all air trapped in the clay. It also allows for the removal of any large rock inclusions missed during the initial destoning. The clay is now ready for potting.